In the cities of India, it's generally hard for me to imagine that anything here could be -- well, like anything but India. But I'm writing to you this morning from outside Munnar, on a road that reminds me very much of Pennsylvania, with its farmlands, and California, with its climate. View from The Shade around sunset last night. My initial visit was great, but Santhosh, the owner, has made renovations since -- expanding rooms, redoing bathrooms, adding wifi. It's pretty incredible! The house is partway down into a valley, with huge mountains left, right and center. The balcony behind my room looks down onto Santhosh's "garden" -- two and a half acres of cardamom and coffee plants, as well as cashew, jackfruit and mango trees, curry plants and so many varieties of flowers and it's a virtual kaleidoscope. 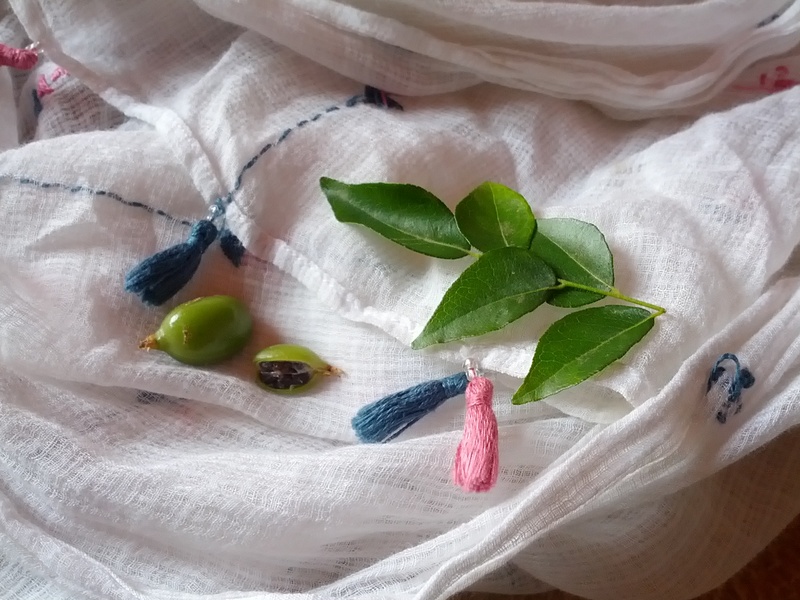 From our tour of the garden this morning -- cardamom and curry leaves. The cardamom has been a small crop for two years, so Santhosh is currently working on replacing his 800 plants -- what an undertaking! The house is about 8 miles from the main town of Munnar. It's right on a road, but not the main one -- so you'll here a truck rumbling by every now and then, but it's mostly crickets chirping, cows mooing and birds calling for sound effects. My photos don't do this place justice, but I'll try to post more later. For now we're off to see tea plantations and eat some yummy veg thali for lunch. I can now add a check mark next "riding a bus" in India. I'm not a huge fan of buses in general. My experience in the States has been that trains are much smoother than long-haul buses, and local buses -- especially in San Francisco -- are too slow and not on time enough. As Kate and I cross southern India, however, there's an abundance of mountains -- and thus, a lack of trains. So our choices have been either to hire private cars or to take one of the many buses available. After a trial 90-minute ride this morning with the Kerala State Road Transport Corporation -- to Ernakulam from Alleppey, where we'd stayed on a houseboat -- Kate and I decided we were up for the 5-hour ride to Munnar. At the total fare of Rs. 131 per person, or about $2.60, it was certainly the economical choice. 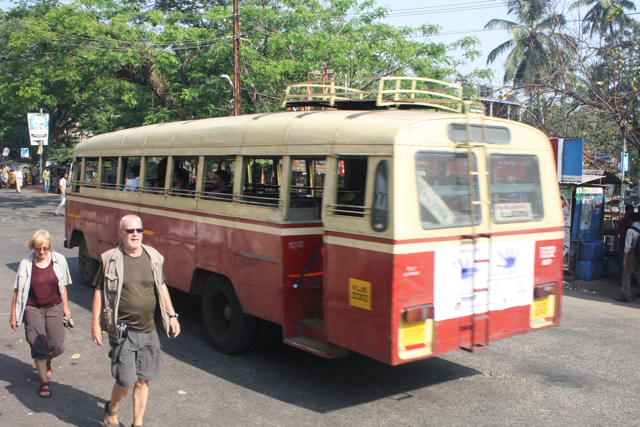 Not our bus, but one similar to it -- in Alleppey. 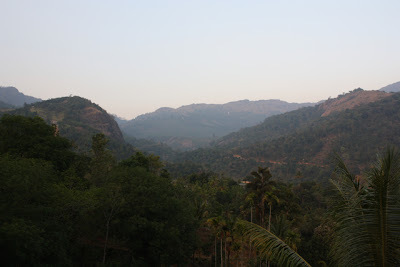 I was a little nervous about heading all the way to Munnar on the bus, as it's a winding road up to the hill station. But I have to say I was fairly impressed with our driver. 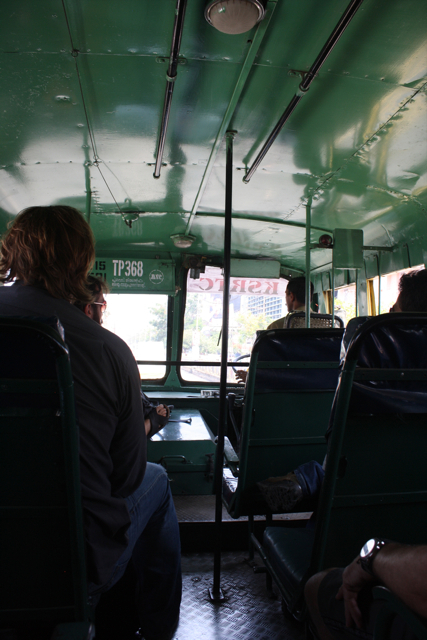 The bus was hot and crowded, of course, but everyone was friendly and helpful. (We also had seats the entire time.) The conductor pointed us to the right stop (we got off just short of Munnar, at a junction closer to our homestay) -- and two other backpackers helped toss our bags off the bus. Inside our bus from Alleppey to Munnar. Think U.S. school bus in terms of style. All in all: I think this was a smoother ride than when I traveled up the mountain by car in 2009. I don't know if I'd attempt this just anywhere, but happy to have a chance to test it out here in lovely, well-planned Kerala. 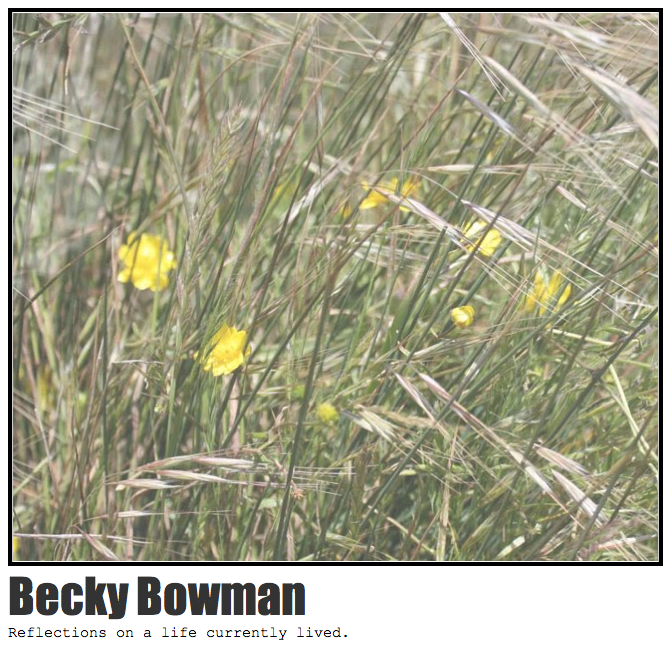 But back to blogging and getting caught up. Another of the food items I wanted to learn on this whirlwind tour of India was how to make Gita-taiji's famous sweets. 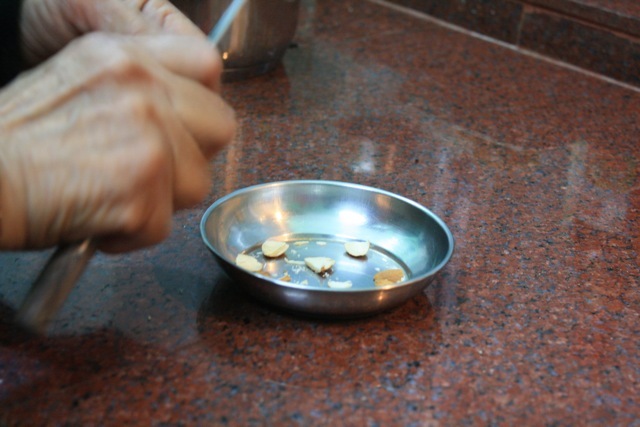 The Dehradun-based aunt has been sending sweets to Vivek and his brother, Mani, since they can remember. 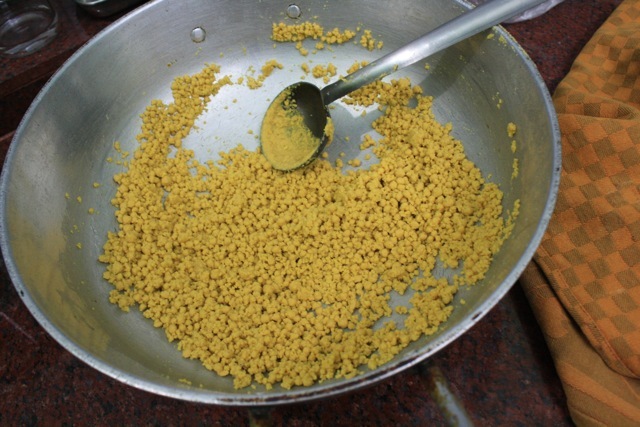 So on a rainy Saturday afternoon, Gita-taiji set about teaching me how to make besan burfi, a sweet made of besan (chickpea flour), ghee (clarified butter), spices and almonds. It turned out to be a simpler process than I had expected, though rather time-consuming overall. Gita-taiji takes over to demonstrate proper roasting technique. 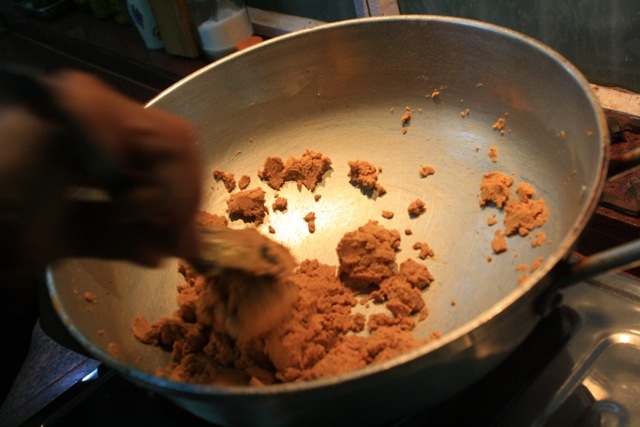 While stirring, it's best to compress the besan against the bottom of the pan, which helps to keep the flour separated, rather than just stirring it. Simply stirring can cause the flour to clump into tiny, boondi-like forms (demonstrated by me). 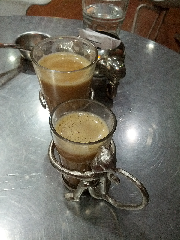 Almond halves provide a nice contrast to the golden color of the roasted besan. 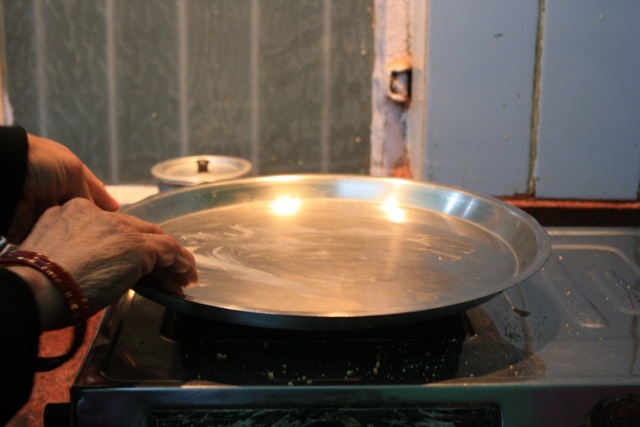 The roasted besan is mixed with cardamom and sugar to create a dough. To make greasing the pan easier, Gita-taiji uses the leftover heat from the stove burner where we roasted the besan. When finished, the sweet will look something like this. All that's left is to separate and package the squares. After this cooking lesson was over, I also watched Gita-taiji at work making bread -- Saturday night's rotis and Sunday morning's parathas. That Sunday sari brunch is getting more and more complete! Roast the besan and ghee together in a pan (a wok would work nicely if you have one) until the besan turns a dark golden color. (This is a simple step but a long one, so be patient. 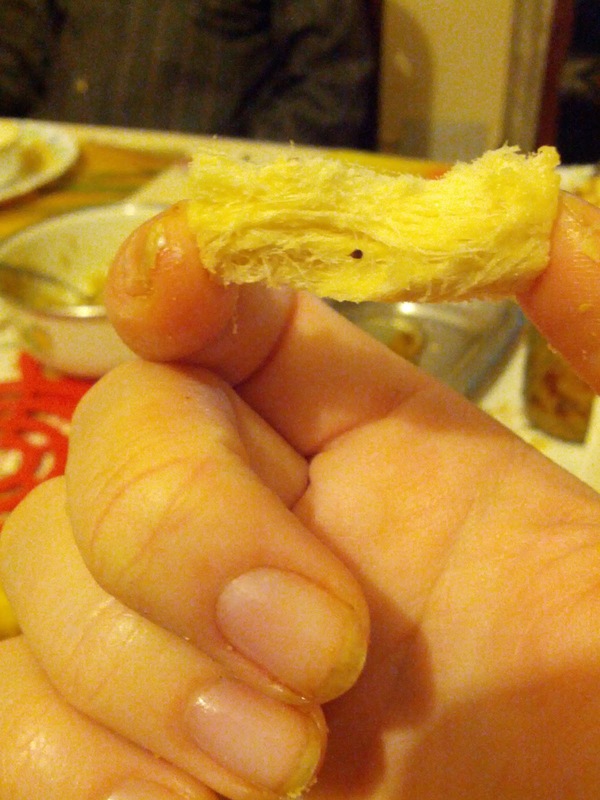 If the besan is not roasted enough, the texture of the sweet will be too chewy.) While stirring, mash the flour against the pan to compress it. Add ghee as needed. 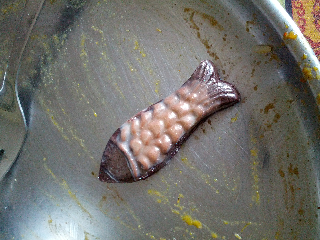 Once the besan has been roasted, remove from heat to cool. While it's cooling, slice almonds in half. When the besan is cool enough to touch, add the cardamom powder and sugar and mix into the dough with your hands. Line a metal pan with a bit of ghee and place dough onto pan, compressing and shaping the form to create a five- to six-inch square that's about three-quarters of an inch thick. 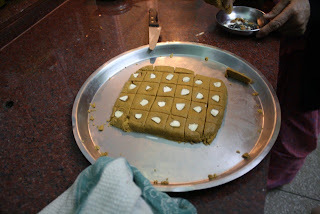 Slice the sweet into one-inch square pieces and place an almond half, skin-side down for contrast, on each piece. Sweets will be ready to package when they can be lifted from the pan without sticking. Delicious. My first fish moile and a slice of cheesecake. Hit the spot! Hello from Fort Kochi! 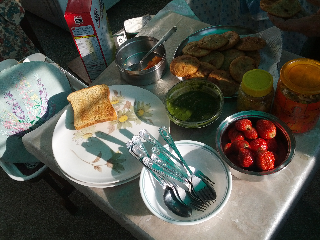 This breakfast is easily a favorite meal in India. 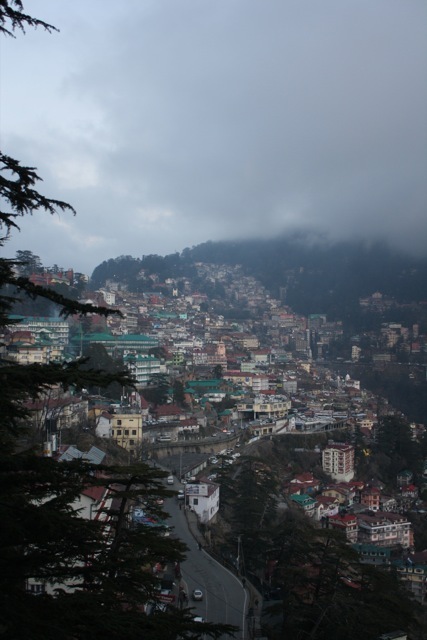 While planning my bharat darshan last year, there were a few specific things, in addition to general family and country history, that I knew I wanted to learn. One of them was Bua's nimbu achar, or lemon pickle. 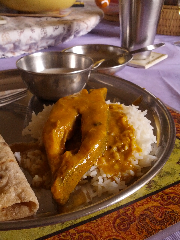 The pickle is similar to other Indian pickles -- but, as it's homemade and a bit sweet, not quite as pungent as others I've tasted -- and, thus, easier on my American taste buds. My mom has been canning jams, veggies and fruits, including her famous lime pickles, for decades. I recently got in on the fun, having preserved a batch of my cranberry-ginger chutney during the holidays. Surely I could master lemon pickle, right? 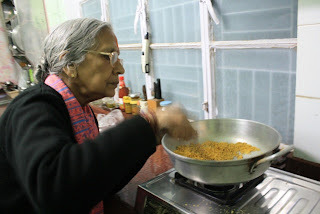 I had mentioned wanting to learn this recipe to the family -- so right after our first lunch in Chandigarh last week, Bua set about teaching me, step by step, how it's done -- assuring me along the way that it is, in fact, a very easy recipe. This process can take as much as week, depending on climate and your access to sun -- so get an early start if you want to serve this at your next brunch! I also recommend starting in the afternoon, as we did, so the recipe will be easiest to follow. Finally, as with all preserving, make sure to wash your hands frequently and to use only clean pans and utensils. Enjoy! The process starts with placing lemons in a bath of boiled water. Next, the lemons are removed from the water, covered and left overnight. 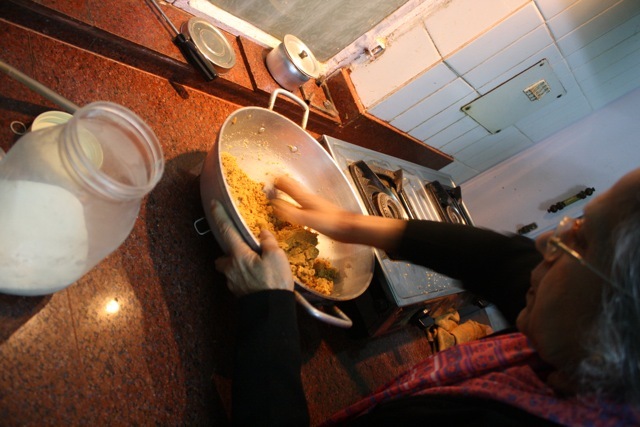 The taste of the pickle owes much to the combination of traditional India spices added. 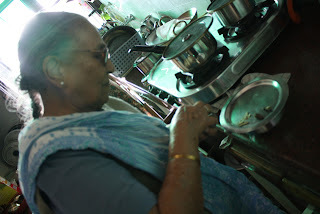 Here, Bua counts out the ingredients for our masala. Bua uses salt, cloves, cinnamon bark, black cardamom, cumin seeds and peppercorns to season her nimbu achar. After adding our salt and spice mix, we left the pickle in the sun to rest again. The last ingredient is sugar. Once this layer is added, it's simply a game of waiting for the syrup to form and then to dry up. Wash and dry the lemons. 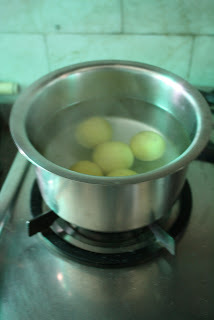 Boil enough water to cover the lemons; remove pan from heat and place lemons into the water. Cover and let sit for four to five hours. 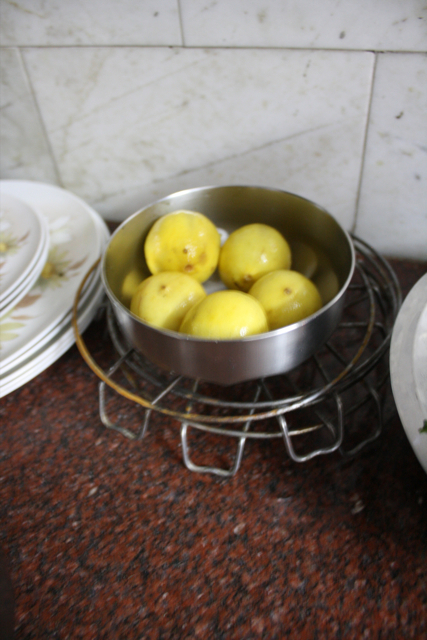 Remove lemons from water and place in a bowl. Cover and let sit overnight. 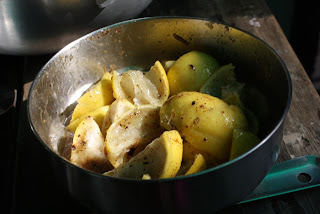 The next morning, dry and quarter the lemons. 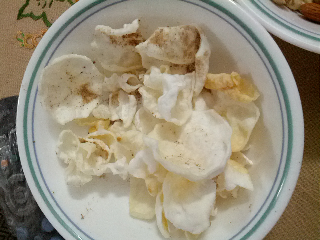 Mix in a non-reactive bowl with the salt. 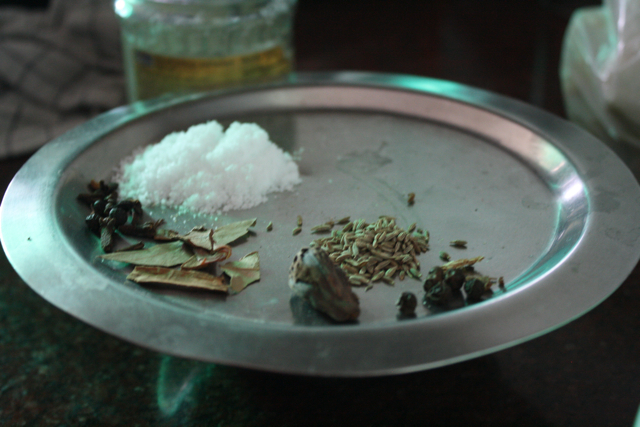 Grind the masala, leaving it a bit course, and stir into the lemons and salt. Cover with a towel or cheesecloth and let the bowl sit in the sun. 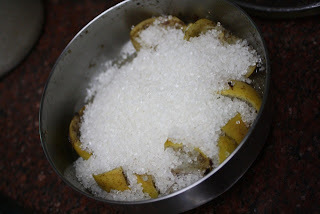 On the following morning, cover the lemon mixture with a layer of sugar; don't mix. Let the pickle sit as the sugar and juices combine to form a syrup around the lemon pieces. For several days, or until the liquid has mostly dried up, allow the pickle to continue sitting, covered with a towel or cheesecloth, in the sun. Once complete, place in a clean, dry jar. At nearly three weeks into my trip -- and fast approaching the mid-point -- it seems time for a small amount of constructive criticism on my journey to date. I set out to learn more about Vivek's family and country, to write and to relax a bit. On the first point, I'm sailing. 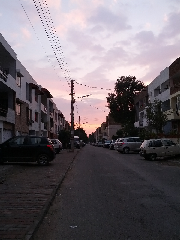 I've been learning up a storm -- and, ergo, traveling, having been in six towns just in the past week (Chandigarh, Dehradun, Shimla, Bangalore, Mysore and the Kolar Gold Fields). It's been far more difficult to find time for my second two goals of writing and relaxing. With that in mind, I've set aside my Sunday here in Bangalore to do a lot of both. I've already read the New York Times online and had my morning mini-nap, so it's time to settle in. Stay tuned for additional posts! 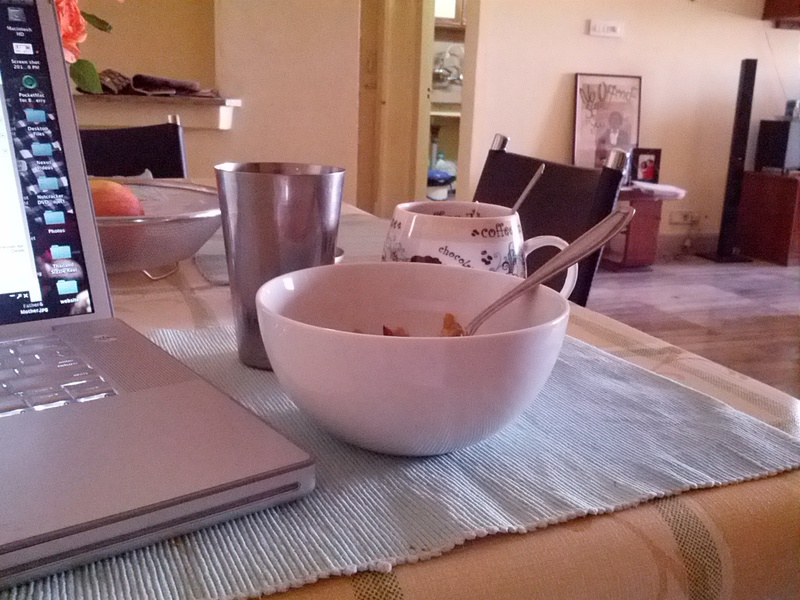 Laptop, water, tea, cereal with a big scoop of peanut butter -- all the ingredients for a successful writing session. 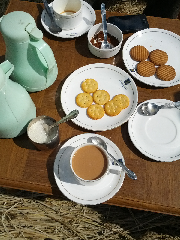 Bundar aur hathi ornaments at tea with devrani. 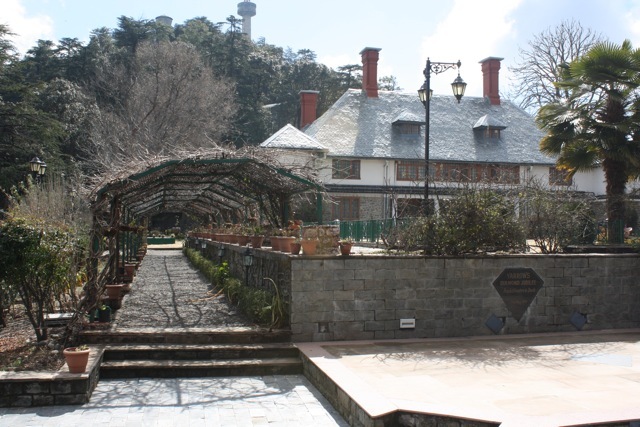 A belated post from our brunch on Sunday in Dehradun. 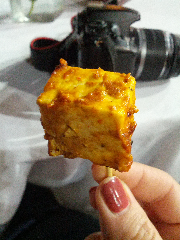 Gita-taiji's homemade paneer was delish -- much fluffier than I've been able to manage in my own experimenting. Something new to aspire to! We also had homemade parathas. I didn't try my hand at making them, but I did watch and take copious mental notes as Gita-taiji rolled, folded, added oil and rolled again before placing the dough on the tava, a great little pan for making Indian flatbreads. 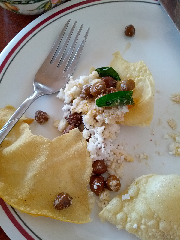 With all of this learning, I'm starting to plot out a homemade "sari Sunday" brunch for when I'm back in San Francisco! 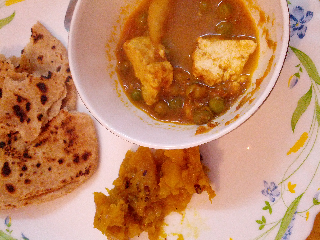 Homemade mattar paneer and parathas. Check out that fresh watermelon! Yum -- what a treat. 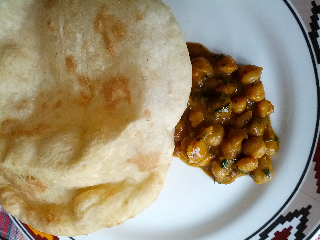 Possibly the best bhatura I've ever had. So soft! 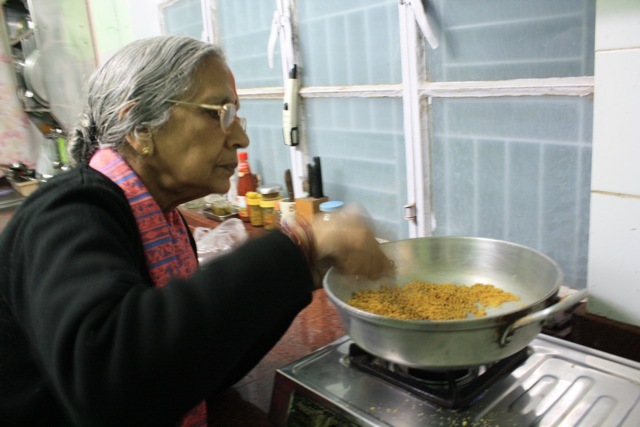 And the channa was flavorful but mild and smooth. At The Pinewood in Barog, a mid-point between Shimla and Chandigarh. 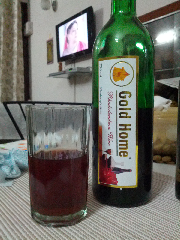 A Himachal Pradesh specialty. Not bad, especially for roughly USD$4.50. Very fruity. Definitely not what I thought if when I would see these plants growing up at home! 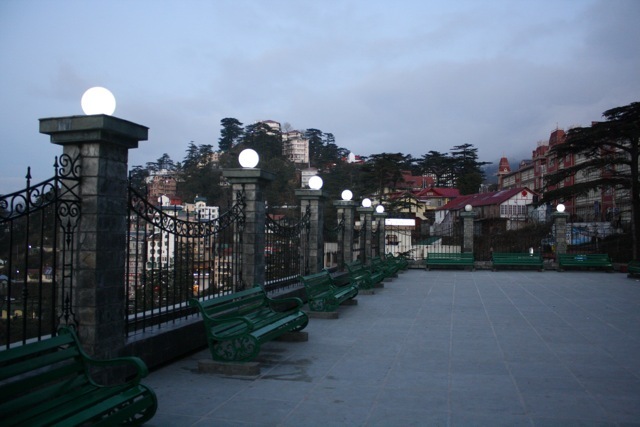 We've arrived in a place that, if I weren't seeing it myself, I might find hard to believe: Shimla, where the air is crisp and cool and there is order, peace and loveliness all around. In honor, a rare photo post for me. The Yarrows, my current home away from home -- a training house for new entrants into the audits department of the Indian government. Pops stayed here in the mid-'70s for his training. We spent the afternoon walking through 'The Mall,' all in a circuitous route to Gorton Castle, the home of the audits department here. Pops has been beaming like this all day. 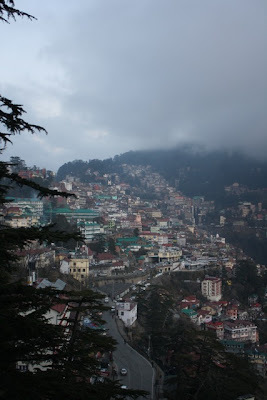 As evening settled over the city, fog walked up over the mountains much the same way it does in San Francisco. Here, a few from Gorton Castle back toward The Mall. A last view back toward the city as the lights began to turn on. We're off to dinner, but I'll post more photos later. I could get used to all these breaks! De rigeur upon landing up, after all. 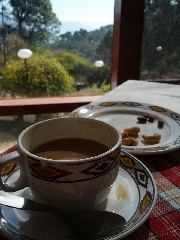 Tea break en route to Shimla, somewhere near Dagshai. 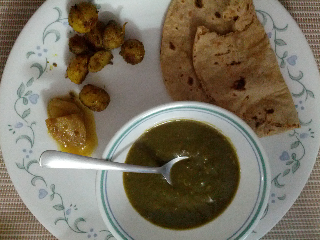 I have a found an Indian spinach dish to love: Vinita-didi's palaak, which was very similar to soup. What a dinner! 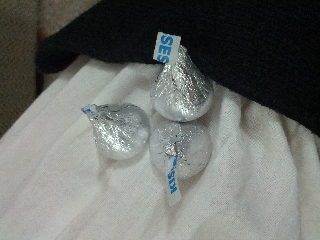 And as an extra treat, we had Hershey Kisses for dessert -- some of Vinita-didi's stores from her last trip to the States. 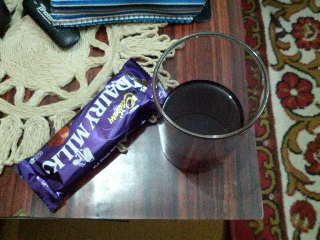 I've been missing my own stash, which I mistakenly left behind in Bombay, so these tasted extra good. I am so well taken care of here! 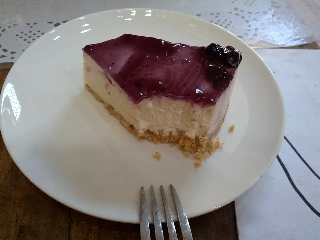 "Land of Rain" might be a better nickname for Dehradun in the 28-odd hours since I arrived here -- but in memory, for me, it's the land of sweets made by Gita-taiji, wife to one of Pops' six brothers. We arrived yesterday afternoon and have had something sweet at every meal thus far. We started off at lunch with Gita-taiji's homemade gajar halwa. 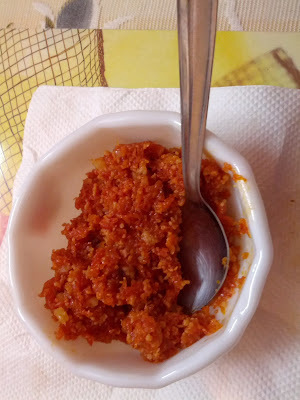 Gita-taiji's homemade gajar halwa, that delicious carrot pudding. At tea, we had an entire array of sweets to choose from -- so, obviously, I took one of each. 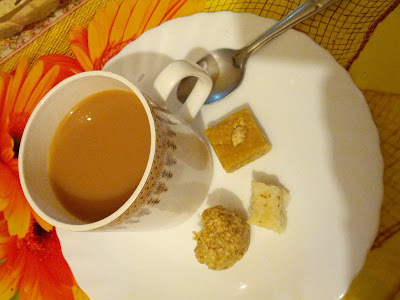 An assortment of Gita-taiji's sweets, including (l-r): sesame seed ladoo, coconut burfi and besan burfi, which is made with gram flour. Finally, we finished off dinner with a bit of gazak (more on that soon in a #latergram food catch-up) and some soan papdi. As you can see, I might have been underestimating my sweet tooth when I told Anna R. that I hadn't quite yet developed a taste for Indian sweets. As it turns out, I've been diving into them at every turn on this trip. At the moment, in fact, I'm being summoned for my cooking lesson. Perhaps I'll be making some of these myself soon in San Francisco. 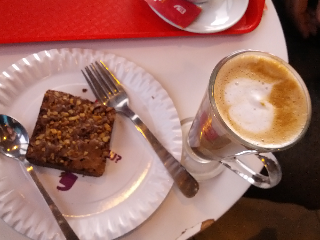 A kind of Valentine's treat, a day late -- and the perfect antidote to the damp, rainy weather here in D'dun. On arrival at Dehradun today, as it began to pour outside (good timing! 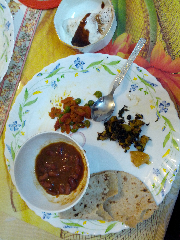 ), we sat down to a lunch of rajma and other veggies with rotis and rice -- and dahi vadas. 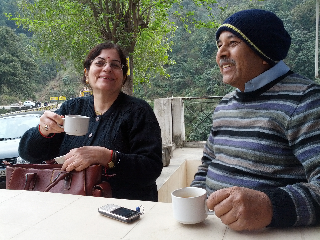 We stopped for a cup of chai this morning at the mid-point to Dehradun. It was quite sweet, as Pops says is the local custom. 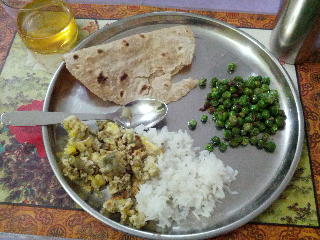 Tuesday's dinner: Egg bhurji (scramble) with mattar (peas). Pardon the flurry of these posts -- much catch up! 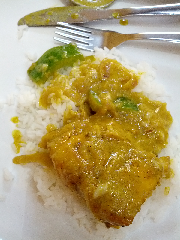 Here: Fish curry at home Monday in Bombay. Pomfret in a tomato-coconut milk sauce. Quite a spread, huh? 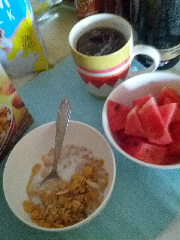 The usual cereal and fruit, plus some mattar kachori made by Vinita-didi. Mrs. Pradhan, the same woman who made the delicious dessert cups, also made lots of other chocolates for us, including these little fish. (Thank you!) I ate this one on Monday. 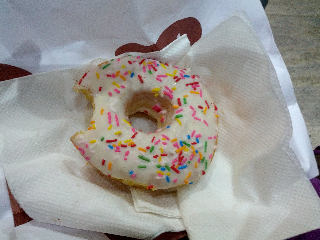 A belated donut for Fastnacht Day, had yesterday at Bombay domestic airport. As I was finishing my packing for my trip at home in San Francisco, I found out that Naren-tauji, an uncle who lives in Jaipur, has been gathering Shankar-Bhatnagar family info together on a website. I’m still learning about it myself -- and what a boon it is for this trip! -- but Bua and Vinita-didi hadn’t yet seen it, so we spent a bit of time yesterday showing it to them here in Chandigarh. Pops' parents -- though I swear, that could be Pops himself. 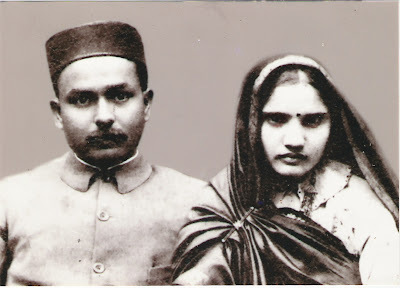 A family photo from 1951, at Sukh Bihar. 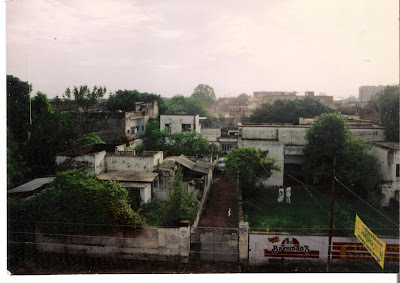 Finally, if you keep poking around the site, you’ll end up finding this photo of Sukh Bihar, the Shankar-Bhatnagar homestead in Kanpur (in the state of Uttar Pradesh, southwest of Delhi). Sukh Bihar, the Shankar-Bhatnagar family home in Kanpur. That's Bua and a tenant of the complex on the lawn. “I’m standing there!” Bua said as we opened the photo. 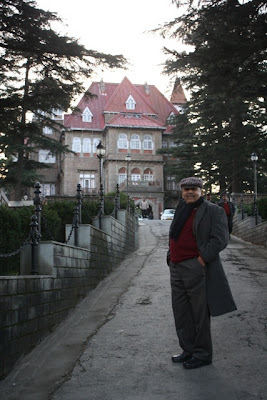 Much of the family spent time at this home -- including Vivek and devarji when they were little kids. It had three sets of “houses,” for lack of a better word: two to the left of the driveway, and one to the right, behind the yard where Bua is in fact standing. Vivek tells great stories about sleeping outside on cots in a courtyard there, under the stars, when it was too hot to sleep inside. I’ve always been keen to see the place, although most of the buildings were torn down after the complex was sold about a decade ago. Perhaps that’s a journey for my next trip.